BARC Admit Card 2018 activated by Bhabha Atomic Research Center (BARC) on 9th March 2018. BARC hiring the Scientific Officers through OCES/ DGFS programme, for that purpose it has scheduled the exam from 28th March to 3rd April 2018. Freshers applied for this and interested to download the hall [email protected] www.barc.gov.in. Call Letter link of OCES and DGFS admission exam is below given. 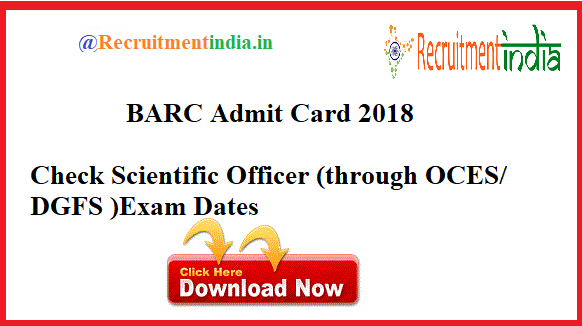 Download BARC Scientific Officer Admit Card 2018. The details enrolled people for the BARC recruitment of Scientific officer posts through the programme of One-year Orientation Course for Engineering Graduates and Science Postgraduates (OCES) and Two-year DAE Graduate Fellowship Scheme for Engineering Graduates and Physics Postgraduates (DGFS) might preparing for the BARC exam which is going to happen from 28th March to 3rd April 2018. Nearly this exam is conducted for 7 days across various exam centre locations in India. The respective exam hall ticket download accessibility will begin from 9th March 2018. BARC Scientific Officer Hall Ticket. BARC full form is Bhabha Atomic Research Center is the predominant nuclear research centre in India. It is one of the large central government organisation. It promotes the employment offers to the perfectly eligible and well-talented candidates only. Directly we can say that if you have the technical skills useful for BARC job profile, then the organisation won’t think to give you job. As a fresher BARC will take against the posts Scientific Officer. But to join in that post first you have to obtain the One-year Orientation Course for Engineering Graduates and Science Postgraduates (OCES) and Two-year DAE Graduate Fellowship Scheme for Engineering Graduates and Physics Postgraduates (DGFS) course completion certificate. Afterwards of this training only, your job is confirmed as Scientific Officer in BARC. To secure the seat in these either of the courses, you have to appear for this BARC Scientific Officer exam on 28th March to 3rd April 2018. Check New Recruitments in India. Notice the official link of BARC Admit Card 2018.
www.barc.gov.in BARC Scientific Officer (through OCES/ DGFS ) Call Letter. The exam will be conducted in Online mode only. The syllabus of appearing BARC exam can be checked through our other posts. Very good opportunity was at your doorsteps for the candidates who are submitted forms for this recruitment. They just have to follow our instructions and download the admit card of BARC simply. Bhabha Atomic Research Center (BARC) will give the BARC Admit Card 2018 of Scientific Officer link activated update on 9th March 2018. Accurately application submitted postulants only get the valid admit card of BARC when they have given the valid log in credentials. Know the exam centre location earlier to the exam date. So that you can not struggle in finding the exam centre on the exam date. Attentively observe the exam instructions printed on the hall ticket and know the things that has to carry to write the exam.